WHEN YOU RIDE A BIKE THERE ARE MANY interesting sounds that seep into your ears if you’re paying attention. Sounds that you normally never hear while motoring in a car or even taking a short walk. Take a nice long ride on your bike and pay attention to the symphony of life that is all around you. Nature. I ride on several rural or tree lined roads in NE Florida that are teeming with wildlife. I get to experience squirrels chattering, birds singing, the screech of a hawk flying high above, the sound of horse hooves running in the corral next to me, rabbits running through the brush, and other animals including deer and the occasional alligator, and they all make noises that add to nature’s choir. Children playing. When my ride is nearing its end, I make a final turn near my house where there’s a school yard. There’s nearly always children playing outside on the playground. There’s really nothing that can compare to a yard full of kids running, swinging, sliding, laughing and having fun together. To me it sounds like pure joy. Commerce. I often hear jets and small aircraft flying overhead, boat horns signaling to open the drawbridge, and the ferry blowing its air horn as it departs the dock. I also hear trains clicking down the tracks, and train signals at crossings. Voices. When I ride through the historic part of San Marco, I often stop at a red light near a restaurant with umbrellas and sidewalk dining. For a moment or two I can eavesdrop on conversations and hear the laughter of people enjoying one another’s company while sharing a meal. Wind. I love the white noise of the wind rushing past my ears. Headphones or earbuds have become a fashion accessory these days, forcing media into your ears nonstop. I enjoy a break from the noise, a break from music, a break from the screams of advertising. Listening to the wind is a welcome relief. My bike. When I get farther out of town I hear things closest to me. I hear bike tires rolling on pavement, chain movement when I shift gears, and the clicking of a coasting rear hub. Me. I hear my breath. I enjoy listening to my breathing. When it’s deep and clear, I feel like I’ve done something good for my body. When its raspy or strained, like after having a cold, I know I am working to make myself well again. Take a nice long ride or your bicycle, leave the earbuds at home, and pay close attention to the myriad sounds you’ll hear. You will gain a renewed sense of community, and it may even bring back some memories of when you rode your bike as a kid. The sounds of life are happening all around you. The symphony is free of advertising and the sounds just may renew your spirit. It’s always important to keep your bike in clean, working order. Lubrication, good tires and routine adjustments will keep it rolling along for years. But the real machine is you. Cycling goes a long way toward maintaining your body, the real engine that puts power to the pedals. It will help you eat better, sleep well, and stay fit. Riding a bike will help you keep your blood pressure in range, and stay youthful and energized. We all need endurance to keep going everyday. Most of us have numerous activities and chores that must be completed on schedule. Couch potatoes are typically fatigued and lethargic. They have no energy. Cyclists, on the other hand, are full of vim and vigor. Why? Because they regularly hit the road or trail to get their heart pumping, make their lungs work and keep their muscles toned. Build your endurance one day at a time. If you’re a healthy person, try pushing your limits a little everyday. Your endurance will increase and so will your energy. Riding a bike does something interesting to your head. It makes you forget about your troubles. It has a marvelous way of erasing worry and tension. Time slips by effortlessly. Cycling can turn a garbled, dark, bad mood into clear, creative thinking in just a few minutes of pedaling. Go ahead! Just try keeping the day’s frustrations in mind while you crank out ten miles. Of course you’ll breathe. But try mindful breathing. While you’re pedaling through the neighborhood, take in purposeful, deep, lung-filling breaths. Then, blow the air out slowly. Repeat this 2 or 3 times every 15-minutes or so. You’ll be amazed at how refreshed it makes you feel. The life-lessons derived from a great bike ride most often occur at a slower place. Slow down and “smell the roses” as the saying goes. If you’re not actually smelling roses maybe you’re enjoying the breeze and salt air off the ocean, or admiring that historic home in a neighboring community, or enjoying the shade and smooth pavement under a long tunnel of trees. Learn to enjoy every minute on your bike. Take care of your head, and your heart, and your body. Look for life’s unexpected joys. Keep the faith. Hold onto hope, and open yourself up to all the lessons that riding a bike can teach you. What interesting lessons have you learned while riding your bike? I’M ONE OF THOSE CYCLISTS WHO LIKE NUMBERS. When I ride, I monitor my heart rate, I know my speed and cadence, and I track my mileage and calorie burn. There’s nothing wrong with that, I just happen to enjoy keeping the numerical values of each ride. But I also know the importance of riding for the shear enjoyment of it. It’s easy to fall into the trap of over-analyzing each ride, a habit that has the potential of reducing the fun and making your ride seem more like a duty. I think about this often, and offer you a few ways to keep cycling fun and interesting, and something to talk about with the folks who aren’t interested in your numbers. Take a look at the bike rides you do from a new perspective--at least some of the time. Do you smell rain in the air? Analyze the clouds and wind direction and plot a course to escape the rain. If it adds ten miles to your ride, great! It’ll subtract additional calories from your daily intake. And it's fun challenge! Interval action: Crank it up past that house with the loose, barking dog in the yard. Feeling strong or just a little bit daring? Go back the other way and give Fido a real aerobic workout. Throw him a doggie bone if he gets too close. Find an alternate route. Research and map a new course to avoid that dusty, bumpy road construction. Elevate the mundane. Your bike can elevate tedious car trips and errands into something that's enjoyable, healthy and memorable. Did you forget to mail those holiday cards to the nieces and nephews? Ride to the post office and drop them off. Or make your bank deposit from your bike at the drive up window. Getting in the queue with cars is always good for some quizzical looks and commentary from the kids in the car next to you. Plan for fun. Don’t waste time sitting in the car waiting on someone. Recently, I drove my wife to an interview in an area of town I wasn’t familiar with. I checked out the roads on Google Maps, threw my bike in the back of the Jeep, and delivered her to her interview. Rather than a long boring wait sitting in the car, I unloaded my bike, went for a fun ride on some beautiful open roads in the outskirts of town, and came back an hour later. By the time I cooled down and re-loaded my bike, my wife was finished and we drove home--me with 600 calories less than when we started. Lunch rides: If I know I can’t get away for a longer ride, I’ll take a short lunch ride. Short is better than none. I generally leave after 1:00 P.M. to avoid lunch hour traffic and get in 45 to 60 minutes of riding. Back at work, I feel energized for the remainder of the day. You say your Saturday morning ride buddies cancelled? Now would be a great time to take a small camera with you on the ride, and photograph some other cyclists that you pass along the way, or the fishing boats pulling out of the harbor, or the livestock lounging in the pasture. Try to get your bike in the photo as well. It’ll make your story more interesting later. So, is your cycling on purpose, or for fun? Your bike, that simplest of human-powered machines can be both--and more. It can help you make a statement, save fuel and money, reduce your carbon footprint, burn calories, become your fitness regimen, or just deliver fun, purposeful, memorable good times. Cycling is what you make it. What’s your favorite part of cycling? I ENJOY SIMPLICITY. And the bicycle is the simplest of machines, yet it provides so many benefits. For me the bike is a freedom machine. When I get on it and ride, it might as well be a space ship going on some new adventure. The most fun rides are those where my destination is unknown and I have no time limits. Of course, I also have some practical uses for the bicycle as well. I run errands on it, and it’s my main piece of health and fitness equipment. It’s important to me to get out there and crank it up; get my heart rate up, push myself past my comfort zone. That’s a big part of how I achieve fitness. Some folks like to race. Criterium, or crit races, are run on short courses and often held on closed off city streets. They’re fast and furious and often filled with passionate younger riders—for obvious reasons. There are also road races. Road racing began as an organized sport in 1868, and has gotten quite diverse and competitive over the past 150 years. There are many levels of road races, and you’ll find competitors of all ages. And then there’s cyclocross. Cyclocross racing is wild and wacky, fun and strenuous, fast and competitive. I've never done it, but it looks like a blast! There are many ways to have fun on a bicycle, and everyone has their own favorite part of cycling. When I was first getting serious about cycling as an “older guy”, a friend of mine told me, cycling is a beautiful thing, you can make it anything you want it to be. He was right! It’s one of the most versatile sports I can think of. So grab a bike and start crankin’! And remember this: it’s never too late to have a happy childhood. How many bikes are too many? I JUST READ THAT JAY LENO OWNS ABOUT 135 automobiles and about 90 motorcycles. (I’m not sure he knows the exact number.) That seems like too many to me, but if you can afford it, who’s to say what’s too many? Seven years ago I was out shopping for my first good bike in over 25-years. The salesman said something to me that I thought was a little presumptuous. He said, "If you'll come back to me when you buy your next bike, I'll give you 15% off the retail price." I thought to myself: Hmmm, I don't think I'll be buying another bike like this for a good long time—if ever. I was 52 at the time and spending over $1600. I was sure I’d be riding this bike for many years to come. But, I smiled and said, "Okay, I'll keep that in mind." And, it's true; I'm still riding my Bad Boy Ultra. I still think it's a cool bike, one that is effective on the road and can be easily adapted for off road. But I'm also riding three other road bikes that I've purchased since that day and a couple of other older bikes. The salesman obviously knew what I didn't know. And that is, when you're a passionate, serious cyclist, having more than one bike is a very common thing. Buying a new bike is a little like a serious golfer buying a new club. There's something about the feel of it, the heft of it, the way it handles that's just new and exciting. And sometimes, that additional purchase happens over and over again. I mean after all, there are steel bikes, carbon fiber bikes, aluminum, titanium, and of course the latest in fashion cycling--bamboo! Then, there are mountain bikes, and, well the list goes on. Cyclists don't always buy new bikes either. 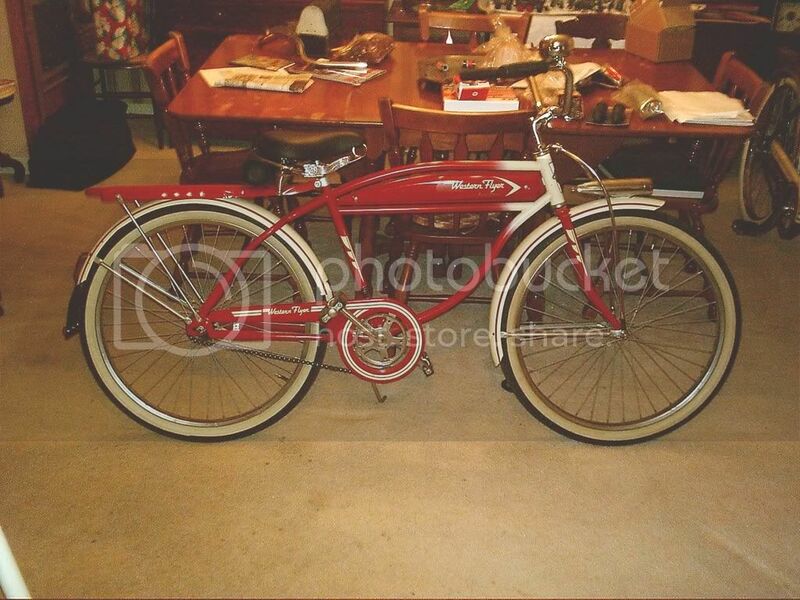 Sometimes riding an old classic Schwinn will take you back to a simpler time. Or you'll come across that Western Flyer that you owned when you were 12-years old, that you just have to have. I know cyclists who only have one bike, but I know more who have three bikes, or seven bikes, or twelve bikes. And all of them get ridden over the course of a year. The serious cyclist, whether he owns one bike or many, generally also owns most of the accessories and tools that he needs. Before the economy bottomed out I went on a tool buying frenzy. And, just last week on Twitter I posted, “I just discovered I own 15 jerseys. Should I be embarrassed?” My followers answered with a resounding, NO! In fact most of my tweeps had way more than I did. So the question becomes: How much of a good thing is enough? The answer to that question is, of course, a personal one. But ask yourself these questions. How much do I love the sport? How much time do I spend on the bike? Will I actually use more stuff if I have it, or will it sit in the garage or the closet to impress my friends? And perhaps most important: Will I get support for the purchase from the family CFO? I look at it this way. Cycling is my main outdoor sport, and I love it. It makes me strong. It keeps me youthful. It bolsters my immune system. It keeps my weight in check and helps me sleep better. (It also got rid of a nasty cholesterol problem.) These are all good things. Immersion in my sport is important to me. I enjoy having bikes, new and old, and the equipment to make the most of them. In this scenario, can more really be too much? ARE YOU LOOKING FOR A FITNESS activity that’s highly beneficial, but not too hard on your body? Maybe you’re creeping up on middle-age (what is that now anyway, 60, 65? ), and the health club scene is not working for you anymore. Do you like to get outdoors for your exercise? I was once a runner, but back problems made pounding the pavement too painful and demanding on my framework. I needed something less jarring, but just as aerobic. Does that sound like you? I also tried golf, but for me it was too slow, too expensive, and had little to do with fitness. Maybe your fitness level isn’t what it once was, but you want to get it back and you’d like a sport that you can start off in a small way, and develop it into something more later. Maybe you’ve never really had a good fitness level, you’re sick of being flabby, and you’ve made up your mind to finally do something about it. The answer can be found in the bicycle. Two wheeled. Three wheeled. Mountain bike. Road bike. Hybrid. There is bike to fit your needs, and a level of bike riding to fit your lifestyle. The planet is on a roll. There are more and more people taking up bikes and bike riding than ever before. When I was first exploring the cycling world, a long-time cycling friend of mine said, “Lloyd, this is one sport that you can make your own. Take it wherever you want to take it.” And he was right! You can ride solo, or make it a social event and ride with a group. You can ride hard, or you can ride easy. You can ride far and see the countryside, or you can ride in your own neighborhood. You can race if you’re so inclined. You can ride in charity events or simple club rides to the coffee shop. Or you can pedal through town on a piece of bicycle art like this from Vanilla Cycles, and just look awesome! Is a bike a bike? Cyclists are a diverse bunch, and bicycles are equally so. Perhaps you’ve thought that a bike, is a bike, is a bike. Well, you’d be wrong. Here are just a few of the ways you can make bike riding your own sport, riding a bike that fits your purpose. The Roadie: So named because he or she rides a “road bike”. That’s skinny tires rolling on smooth pavement. There are fast riders, slow riders, social riders and solo riders. The Randonneur: This is a highly self-sufficient, endurance type roadie that loves the long ride—very long! Rides often last from 1 to 4 days. So far I’ve only mentioned cycling on road bikes. But there are many other options. The Commuter: A commuter may ride any style of bike from a road bike, to a mountain bike, to a hybrid bike. Commuters are on a mission. They ride to work, to the store, even to pick up the kids at school. The Mountain Biker: Guess where they ride. In the mountains and on off-road trails on heavier bikes built for rough terrain. The Fashionista: If you can think of bicycles as a fashion accessory, you get the idea behind cycling chic. It’s the culture of comfortable urban cycling in fashionable clothes and accessories. It often involves gorgeous bicycles with classic lines, and stylish riders, many of whom are female—but not all. The options for bike riding are virtually limitless. There are sit-down bikes, called recumbents, three-wheeled machines for stability, and foldable bikes you can carry with you on trips. It doesn’t matter if you’re young or old, in excellent physical condition, or overweight, rich or poor, live in the city or in the country. Cycling can be a sport, a mode of transportation, your fitness machine, or your fashion statement. So, get some fresh air. See the countryside. Revisit your own neighborhood. Get some exercise, a better level of fitness, meet new people, and have fun. Get a bike… and ride it! Feel like a kid again. Make cycling what you want it to be.